The eye functions rather like a camera. There is a front clear window (the cornea) and a short distance behind this and the pupil, lies a structure called the lens. The lens is usually clear and helps to focus light onto the retina at the back of the eye. The retina corresponds to the film in a conventional camera, and is responsible for transmitting visual information to the brain via the optic nerve. As we age, the lens loses clarity and less light is able to pass through it. This results in the visual effect of looking through frosted glass. The lens also loses the ability to focus light accurately on the retina. A cataract causes a gradual and progressive blurring of vision. It can alter the focussing properties of the eye (requiring more frequent changes of spectacle lenses). A cataract can also cause glare around bright lights (e.g. around car headlights or streetlights). Sometimes people become aware of a change in colour appreciation, or that things start to appear rather dull. Patients often comment that everything appears much brighter and sharper after cataract surgery and that colours appear much more vivid. Your optician is qualified to detect signs of cataract. This may be discovered during your routine annual eye examination, or if you attend specifically because you have noticed the symptoms described above. 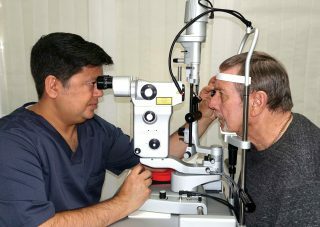 Opticians often refer patients directly to an ophthalmologist (ophthalmic surgeon or eye surgeon). It is not necessary to see your GP although your GP is kept fully informed. The diagnosis of a cataract does not always mean that surgical treatment is required, but advice should be sought if you are experiencing any of the symptoms described above. If you wish to have cataract surgery or it is required e.g. because you are no longer meeting the legal visual standard required for driving, one of Face & Eye’sveryexperiencedConsultant Ophthalmic Surgeons will remove the cataract and replace it with a clear foldable plastic lens (an intraocular lens or IOL). This operation, when performed by an experienced surgeon, is relatively quick and usually very successful in restoring vision. This is one of the most frequently performed operations in the U.K. Most such operations are performed under local anaesthesia or with “twilight anaesthesia” (local anaesthesia with sedation provided by an anaesthetist). After the operation you will rest for a while and have refreshments. You will be given a dressing pack to swab the eye clean the following day, and some antibiotic and anti-inflammatory eye drops to apply at home after the surgery, for a couple of weeks. If you have cataracts in both eyes, the surgeon will not usually remove them both at the same time. You will usually need to have each done separately, although they can both generally be done within about 2-6 weeks of each other. You should discuss this with your surgeon. Retinal Detachment – this occurs when the retina detaches from its normal position and can result in severe loss of vision if surgical correction is not successful. The approximate risk of a retinal detachment in the general population is 0.01 % per year. Someone who is hyperopic has a smaller risk than this, whereas a myopic (short-sighted) patient has a slightly higher risk than this. Posterior Capsule Opacification (PCO) – is thickening of the residual lens membrane which supports the lens implant. Approximately 25% of patients will, at some stage, notice a reduction in their vision due to PCO. It may occur months or even years after surgery and is easily and quickly dealt with by outpatient laser treatment using a YAG laser (this is known as a YAG laser capsulotomy). A refractive “surprise”. This refers to an unexpected optical/focussing error following the surgery. Prior to surgery you will undergo a test referred to as biometry. This uses a computerized optical device that takes several measurements of your eye to determine the correct power of intraocular lens required. These measurements are very accurate but occasionally the lens selected does not provide the desired visual outcome. This might require spectacles/contact lesnes to improve the focussing, further surgery to exchange the lens or corneal laser surgery to correct the error. The lens implants we use are usually left in place for life.